The Canyons of the Ancients National Monument in southwest Colorado has an impressive title. It boasts the highest known density of archaeological sites in the country. Some stretches of this monument boast an amazing 100-plus sites per square mile. Nowhere else in the United States can you see so many ancient sites, art, and artifacts than you can at this monument scattered across 176,000 acres. The adventure and discoveries seem endless. 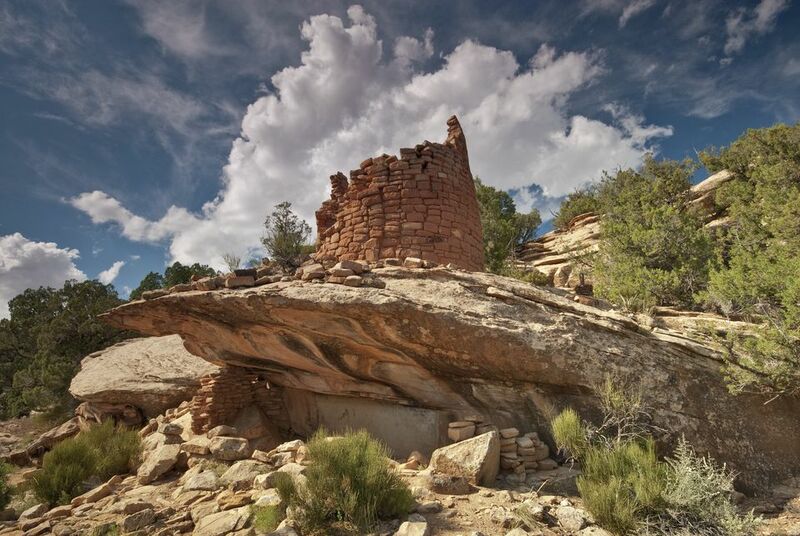 This national monument has more than 6,350 documented ancient sites (and an estimated 30,000 total sites), including kivas, rock art, and even multi-room dwellings of the ancient residents of this region. The remnants left behind give a glimpse into the lives of the native people, from their shrines to agricultural fields to sweat lodges and fascinating petroglyphs. Canyons of the Ancients was designed a National Monument in 2000. This site is a bit of a trek. It’s more than seven hours southwest of Denver, so many visitors tack it on to a visit to Mesa Verde. It’s less than 45 minutes (12 miles) from Mesa Verde and about 10 miles west of the small town of Cortez. The monument is in the Four Corners region (that’s where four states meet at one point). The Four Corners is also a popular spot to visit and take your picture with your feet and hands in the four states, the only time you can be in four different places at once. Canyons mark the northern and eastern edges of the site. To the south: the McElmo Creek and Ute Mountain Reservation. To the west is the Utah border. In the national monument, most roads are unpaved and can be a bit rough. Make sure you have a reliable vehicle, and be prepared to turn around and change plans if the road seems too rough. In springtime, mud on the roads can be a challenge; roads can be slippery and it can be hard to get tire traction. You can also ride mountain bikes on several trails as a different way of getting around. Horses are also permitted in the national monument on some trails. Set aside at least one full day to explore the monument, if not a full weekend. You need about two hours to get through the Canyons of the Ancients Visitor Center first; many of the archaeological sites are hard to find without a map, so you need to stop by this center before you head out to know where to go and what to look for. If you’re short on time, hit up the heritage center and just the Lowry Pueblo. You should be able to do this in about a half a day. It’s open year-round. The most popular time to visit is in the summer. The Canyons of the Ancients Visitor Center is open 9 a.m. to 5 p.m. during the busiest season (March through October) and 10 a.m. to 4 p.m. the rest of the year. The national monument is free to drive into. You do need to pay $3 to enter the visitor center during peak season, but during slow season, it's free. There isn’t an official campground on the national monument site, but you can camp in most areas. We also highly recommend the Canyon of the Ancients Guest Ranch, a charming and hospitable oasis nearby. This is a historic guest ranch at McElmo Canyon, near more than 5,000 archaeological sites right outside your bedroom door. Stay in a private cabin or unique stone houses, like the Elden Stone House, built in the 1880s. This historical, restored home sleeps up to five people. There are several different lodging options to pick from, each appealing in its own unique way. The farm animals that live here are also fun to visit, especially for kids. The Canyons of the Ancients National Monument has great hiking trails and beautiful scenery, but the highlight of this site is the well preserved mark of native communities, most notably the Northern Ancestral Pueblo people, also called the Anasazis who settled in the area as early as 1500 B.C. As a national monument, the area is designated for protection and has a plan to help preserve the important history and artifacts in the area. The area is managed by the Bureau of Land Management. When at the national monument, make sure you visit these points of interest. The Canyons of the Ancients Visitor Center and Museum: Start here, to educate yourself, get a map and also check conditions. Even if you don’t usually like museums, this one is pretty exciting. It has interesting and interactive exhibits about the Native American cultures, the local history, a research library and special exhibits and events. Also, you can use the restroom. Here, you can also find a picnic spot (bring your own, as no food is sold on site), a short, paved nature trail and a gift shop to pick up a memento. Lowry Pueblo: This is a must-see at the Canyons of the Ancients and the most popular site. This 40-room dwelling is well-preserved. It houses eight different kivas. Nearby, you’ll find a picnic area and restroom. Fun fact: Lowry Pueblo was built on top of an even older pit-house when building techniques changed. The Great Kiva: This is an underground kiva constructed around 1100. About 10 years later, the ancient residents built another kiva on top of the original kiva. Today, the Great Kiva in the Lowry Pueblo has been stabilized for visitors; look for the interpretive signs to understand its significance. Historians believe it may have been a place to gather for religious celebrations and worship. Painted Hand Pueblo: This site hasn’t been excavated but you can still see where there used to be rooms built into the side of the mountain. Look for a small tower with a nearly 1,000-year-old handprint. Sand Canyon Trail: This is a popular trail at the Canyons of the Ancients. It is 6.5 to 7 miles long, open to hikers and mountain bikers and will take you to the Sand Canyon Pueblo. Look for wildlife along the way. This trail is considered moderately difficult. You can bring your dog if it is kept on a leash. Sand Canyon Pueblo: This village area is huge, with 420 different rooms, 14 towers and 100 kivas, built around 1200-1290. The ancient village itself has been excavated, but make sure you read the signs along the trail to help you decipher what’s what. Hovenweep National Monument: This is another nearby national monument worth visiting if you have the time (more than a single day). This site has six different ancient villages from the Pueblo period, in the mid-13th century. Pack a lunch. There’s nowhere to buy food in the Canyons of the Ancients National Monument. Bring a picnic and enjoy it on a picnic table near Lowry Pueblo, while you gaze out at the ancient village and imagine what it was like to live here. Respect the culture. These ruins are considered sacred. Don’t disrespect the past, or the present people who still honor this land. Don’t play archaeologist. Digging and tampering with the ancient sites is forbidden. You can go rock climbing. But only on certain areas. Do not try to go climbing on an ancient site. It is fragile and should be protected. Don’t forget the map. You will have a hard time getting around and seeing the sites without one. You can’t rely on a GPS. Cell service is patchy at best and nonexistent in many areas. It's easy to get lost and many of the sites are far apart, separated only by open space. Use your phone for picture-taking only. Elevation here is between 5,500 and 6,700 feet above sea level, depending on where you are in the monument.